Volunteer for the D6 Night Market! Our online registration form for volunteer with the D6 Night Market is now open! More details on the image link below! Online Performer Application Now Available! Vulcan Materials Company returns as a Gold Sponsor! UBER at D6 Night Market in 2016! All 2016 Applications live now! You will be seeing this everywhere soon! 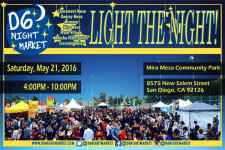 Mark your calendars for the May 21st, 2016 D6 Night Market! SDG&E returns as Light the Night Title Sponsor! Thanks to SDG&E for coming back to help us “Light the Night” at next year’s D6 Night Market on Saturday, May 21st, 2016! D6 Night Market returns on Saturday, May 21st, 2016! It may seem like almost 10 months away, but it will come soon! Mark your calendars – SATURDAY, MAY 21, 2016!